Bachelors degree certificate and list of marks with an average score of at least 70%. Your grade point average must be 2.8 or higher based on a 4.0 system. Are you looking to take your engineering expertise to the next level? Do you want to broaden your career opportunities? Did you or are you expected to obtain your Bachelors degree? Then maybe the Masters degree course Control Systems Engineering would be a good match for you. The additional qualification of this Masters degree at HAN enhances your professional skills so you can effectively manage projects, while balancing engineering, economic and commercial activities. Moreover, you have the technical knowledge to realise and evaluate all control strategies and embedded electronic systems. 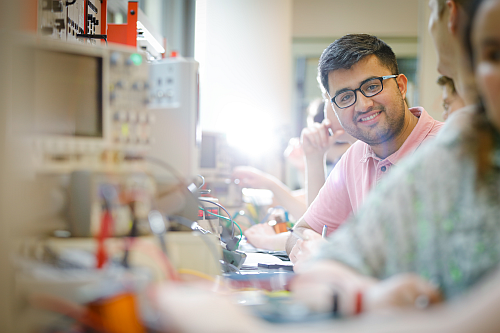 During the Masters in Control Systems Engineering, you put theory into practice during the minor projects and during applied research for your Masters thesis. Research is geared towards solving an actual issue from industry. Students and staff of the Masters in Control Systems Engineering participate in research conducted by the HAN Control Systems Research Group. This research focuses on the interface between energy and mobility, thus contributing to two key priorities at HAN: sustainable development and automotive applications. So knowledge and techniques from fundamental research are implemented in control systems and applied in an industrial environment. This collaborative approach strengthens ties with industry and stimulates the exchange of knowledge. As a result, professional practice is constantly renewed and you benefit from a Masters degree that perfectly matches industry needs. In the first year of the Masters in Control Systems, you follow practice-based modules. First you delve into the theory of the relevant module and then put it into practice during the minor projects, in which you work in small groups of students. These include projects regarding big data analysis, application of model predictive control and optimization studies. In the Systems Modelling module you learn how to create a white box model of a real world process using the 4+1 step approach. In the Applied Control module you learn how to create analogue and digital feedback controllers using techniques as phase and gain margin as well as root locus. In addition, you follow courses that help you develop the skills you need to be able to work in a project team and to conduct research, such as communication skills and research skills. The key modules of the 2nd semester are Big Data & Small Data and Advanced Control. Here you learn how to analyse big and small data and to create a controller that can deal with varying conditions using robust design techniques. Apart from these modules, you also choose to specialise in either mechatronics, energy management or the process industry by working on minor projects in small groups. After completing all the modules and minor projects, you are ready for the Masters thesis. The Masters thesis is completed in an industrial or research environment and takes 5-6 months. Students have previously carried out their in-company Masters thesis at companies like Tatasteel, HyET, Alliander, Marel Stork Poultry Processing. Of course, you are also free to do your graduation project at a company abroad. With a Masters degree in Control Systems Engineering, you are qualified to work just about anywhere in the technical sector. Your expertise will be greatly valued in higher education, research institutes, universities or in R&D departments of companies and organisations across the globe. In fact, in the border region between the Netherlands and Germany, engineers with expertise in control systems are in high demand. Moreover, the additional qualification of a professional Masters degree shows you have the skills to manage projects and conduct applied research: a great advantage in this industry.